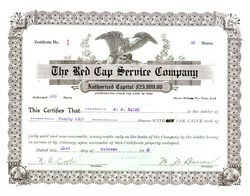 Beautifully engraved Certificate from the Red Cap Service Company issued in 1933. This historic document has an ornate border around it with a vignette of an eagle. This item is hand signed by the company's president. W. W. Bauer and is over 72 years old. The company provided traveler baggage assistance at train and bus stations.